Exciting day in Calgary for the 2015 World Handball Championships. A few upsets, a couple blow outs and many ‘scares’ as players from multiple countries impressed local crowds in both small ball and big ball 1 wall action. Sean Lenning stole the headline in small ball when he forged his way to the semifinals, after a three game defeat of the current 1 wall national finalist, Cesar Sala. “His serve is unreal,” uttered Timothy Gonzalez, as the third set was winding down. “He just won the tournament, from what I just seen!” Lenning held the headline for 20 minutes before Tyree Bastidas, our current 1 wall small ball national champ, ripped the front page in half with a stunning three game loss to Vic LoPierre 10-21, 21-15, 11-8. “This win made the little bit of progress I have been showing, in the weight room and on the court, worth it,” gasped LoPierre. Victor has been making a comeback after taking some time off from the game and is in his first full year back, playing singles. 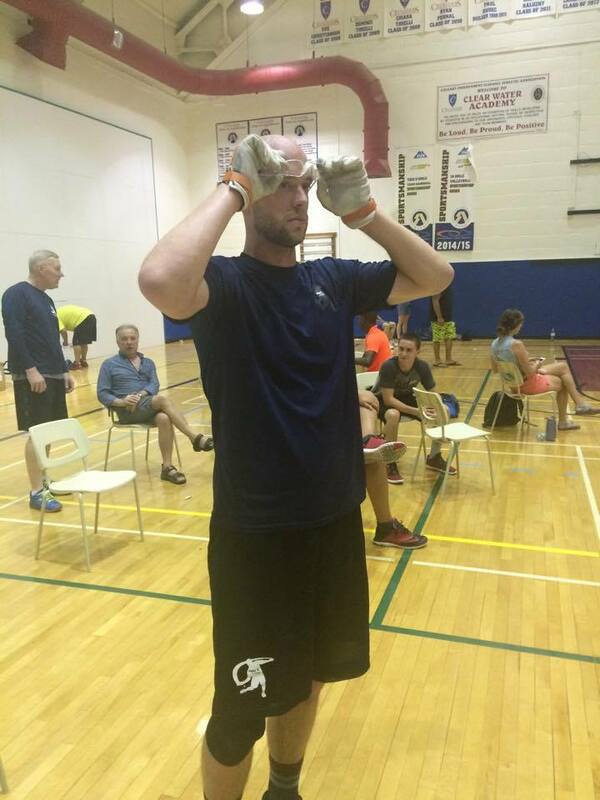 Continuing with 1 wall small ball and after losing to Billy O’Donnell in the quarterfinals of the USHA 1-Wall Nationals just two weeks ago, Joe Kaplan dropped game one to his rival in Calgary, 13-21. Kaplan rallied to force a tiebreaker, but quickly found himself down 0-10 in the tiebreaker. After failing to return a serve through 10 points, Kaplan won the first rally of the tiebreaker and earned a side out. Kaplan proceeded to score 11 consecutive points to stun O’Donnell and match the largest comeback in 11-point tiebreaker history to advance to the semifinals of the small ball men’s division. In the Women’s big ball 1 wall division, all top seeds advanced until Lorraine Havern (5) defeated Karen McConney (4) 21-15, 21-4, but we will not hold that against her. Women’s semis finds Havern and Daskalakis matched up at noon on Friday, while Casey takes on Ng at the same time. Andres Calle will play our current World Champ, Tywan Cook at 11am on Friday, for the upper bracket semi; meanwhile, Timbo Gonzalez, will battle with “The Bus,” Billy O’Donnell, in the bottom bracket at noon. Although the WPH didn’t send a team to Calgary, as they did in 2012 (Irish Worlds), the WPH is tracking results from those regularly highlighted on the Race4Eight Professional Handball Tour, Powered by ESPN & WPH Outdoor Cup Series (3 Wall Big Ball). WPH Executive Director, David Vincent, explains that the Team in Canada is comprised of handball members that approached the WPH with the attempt of promoting the organization to help further the awareness of the sport. “By no means are we attempting to trump the efforts of GAA Handball Ireland, Team USA, #EDTLHandball, the NYAC, Olympic Club or other establishments that sponsor and support this game,” Vincent says. “This Team came together NOT as a World’s Team, but rather a way to honor and promote the players and to possibly add some extra hype to the sport that is in the need of a positive shot in the arm. The top players are leaders and it is refreshing seeing them send us continuous updates (court-side) and promoting the sport.” Over 95% of all updates posted on the WPH main site and WPH social media comes from #TeamRace Members. WPH Members are comprised of athletes and spectators that have picked up their camera phones, notepads and laptops, proactively, to report scores, update us on current issues, highlight behind the scenes and bring light to the game we all love. WPH members are: Volunteers of the sport …of the organization bringing them accelerated Junior Development, The Professional Handball tour, ESPN Coverage & Mass Exposure. Those that are helping to expose the game.